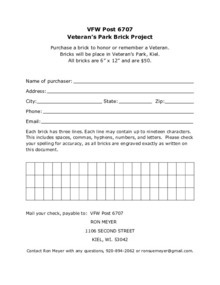 Purchase a brick to honor or remember a Veteran! The bricks will be placed in Veteran's Park, on the corner of First & Water Street in Kiel. All bricks are 6" x 12" and are $50.00. Completed forms should be returned to Ron Meyer. Checks should be made payable to: VFW Post 6707.